Note: this product is aligned using the Grade 5 standards, it could easily be used in a 4th or 6th grade classroom. This plan starts has a full list of writing topics that could be used over 16 weeks. 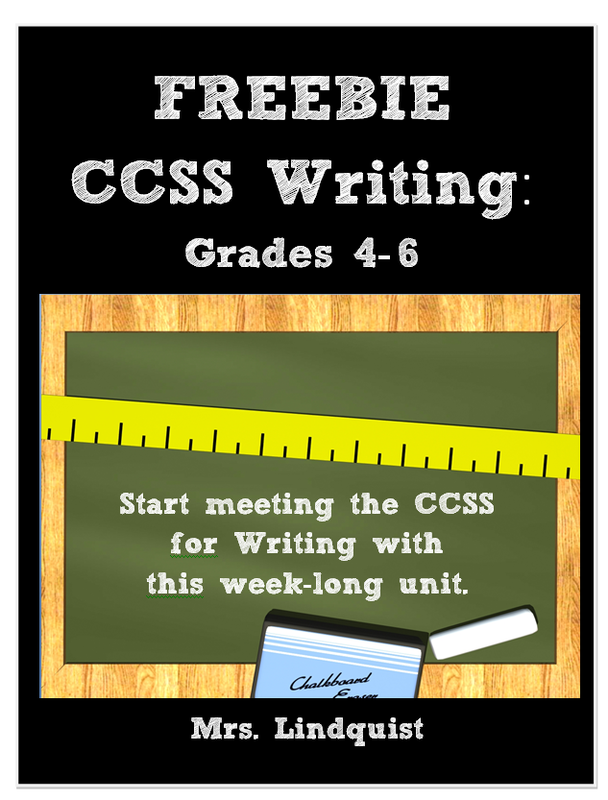 My plan is to create a 16-week writing unit that goes along with this freebie. The next page is a list of all the CCSS writing standards in full (standards not used are grayed out). Then you get to the fun part: the writing topic for the first week which is all about Getting to Know Your Students. These lessons could easily be taught in as little as 10-15 minutes a day, leaving plenty of time for reading and spelling activities. Students will start by completing a one-page survey about themselves. Basics like what is your date of birth, who are your parents, what are your favorites, what hobbies do you have, etc. Then they will work on pulling out their top 6 ideas that summarize them as a person. They will organize these top 6 ideas into a graphic organizer, adding a hook sentence and closer. Finally, they will combine all of their ideas into one great paragraph to turn into the teacher at the end of the week. In four short days, students will write an organized paragraph that not only serves to showcase the student's writing talents, but helps the teacher get to know their new class one at a time. You'll LOVE this freebie!